200 Amsterdam Avenue: GOOD NEWS! WE DO NOT GET ENOUGH GOOD NEWS THESE DAYS BUT HERE IS SOME. DAVID ROSENBERG, LW!’s crusading lawyer has filed the LW! Challenge to the Department of Buildings (DOB)’s shameful and wrongful approval of the seriously flawed plans of SJP Properties for 200 Amsterdam Avenue. The challenge was filed and stamped received by the Board of Standards and Appeals (BSA) on Friday, October 27, 2017. In his appeal David went straight to the point calling the Super Tall nothing more than or less than a “pig in the parlor”. He urged the BSA to apply the law, protect the quality of life in the neighborhood and show developers, the mayor and the residents of the City to whom they owe their loyalty that the BSA is an independent body. To prove their independence, the BSA must reject the plans for this inappropriate Mega Tower. There is strength in numbers. LW! is not alone in fighting this “pig in the parlor”. The Committee for Environmental Sound Development also filed an appeal with the BSA through their lawyer Frank Chaney. Filing legal challenges is a dramatic form of advocacy but it should be a rare one. Once you are at that stage you are playing against a stacked deck. LW! and lawyers like David Rosenberg are fighting hard but we have to level the playing field. In order for that to happen, we, LW! and YOU, must be strong enough to stop continued changes to the rules, regulations and statutes that govern land use in the city. We have to end the inappropriate influence of lobbyists and the pay-to-play system. We have to force City agencies to work for residents and fulfill their legislative mandates to work for the common good not the profit of big land owners and developers. That kind of advocacy doesn’t come cheap. It is time for everyone who relies on and expects LW! to be in the forefront of the fight to step up and donate to support our mission. We cannot do this alone and we cannot do it without money. DONATE NOW. 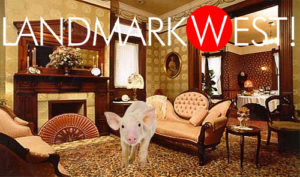 The next time a developer tries to put a pig in your parlor there may be no one to help you!